Erica Eugenio is a counselling therapist based in Guelph, Ontario. We were engaged by Erica to increase her website's ranking for several key terms. She was so pleased with the work so far, that when she needed to redesign her website, she asked SearchEngineOp to get on the case. Since the beginning of the campaign we have seen a steady increase with traffic and contacts that have turned into new patients. Her ability to listen and understand her patients coupled with our marketing work, has turned her practice into a growing success. The new website design is professional, clean and easy to use. A website about counselling services has to generate a sense of trust, calmness and security. In our meetings with Erica we had come to appreciate her sense of humour, her friendliness and easygoing nature, which we felt was important to be shown through her new web design. Her professionalism and care for her patients was also important and was included in our original concepts and final design. Erica has been working with SearchEngineOp to improve her business visibility online. 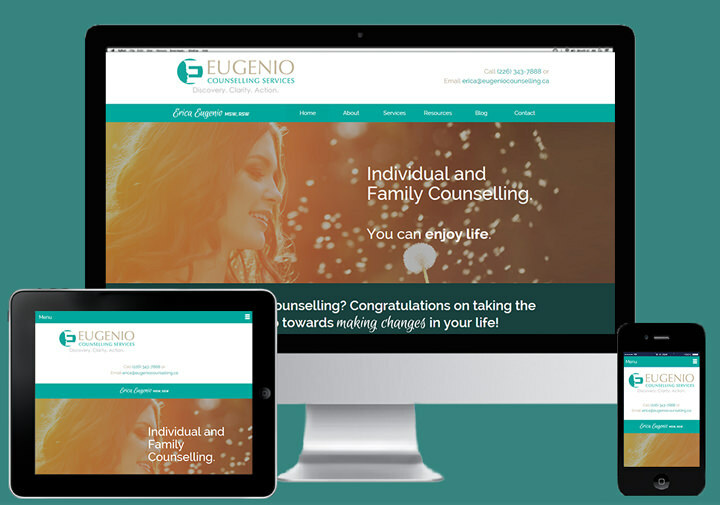 At project start, Eugenio Counselling was not showing anywhere and Erica had invested in other forms of marketing that hadn't turned into clients. Thanks to the SEO campaign, her website ranked highly for related key terms in the region and had a steady flow of traffic and contacts. Mario and Nora are fantastic. My website now captures who I am and what my business is. They have been so flexible with design and content, and are straight forward with what they have seen work and not work. E. Mitchell, Counselling Therapist at Eugenio Counselling.